In the same building where their forebears once studied and learned, students at Bluestone Middle School last week paid tribute to the men and women of color who pursued their education in the segregated era — the staff and student body of West End High School. The African-American youths who came of age in the 1950s, 1960s and 1970s were happy for the opportunity to learn — albeit with torn and tattered hand-me-down textbooks and other materials — for they knew that one day their education would lead them to a better life. 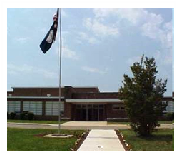 Throughout the school year, seventh grade students at Bluestone Middle School, in remembrance of the 60th anniversary of Brown v. Board of Education, and the 50th anniversary of the Civil Rights Act of 1964, researched the history of West End High School, interviewed its graduates, and reflected on the times during which the school existed. Built in 1951, West End High School was discontinued with the advent of racial integration in the mid-1970s. The building remains in use as today’s middle school. The culmination of the students’ research came this Friday, when Bluestone Middle dedicated a wall of pictures to the graduates of West End High School. The dedication event was followed by a reception to honor the school’s alumni. The program, “Small Acts of Courage – West End High School Project” included a presentation of essays written by the current seventh graders, based on their interviews of West End graduates. One of the more poignant moments came when Brendan King read his “A Day in the Life” essay, describing the hope and promise felt by a young student at West End High School, despite the odds he battled to obtain a good education. Ten years later, President Lyndon Johnson sounded a death knell to racial inequality by signing into law the Civil Rights Act of 1964. The act forbade the use of federal funds for any discriminatory program, and authorized the Office of Education (now the Department of Education) to assist with school desegregation. 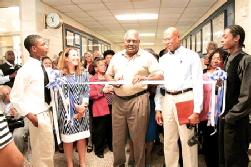 The program ended with a ribbon cutting and reception, which followed the “rededication of the West End Alumni Honor Wall,” outside the library of Bluestone Middle School.